The Arctic Fox (Vulpes lagopus) which also goes by the name White Fox, Polar Fox or Snow Fox is a tough and compact carnivore that lives in the arctic tundra regions of the Northern Hemisphere and lives in conditions that would put any survival expert to shame. The key to the Arctic Fox’s thriving in some of the coldest of conditions on earth is his trademark white fur which is extremely thick and dense and provides the best insulation of any mammal. The Arctic Fox has further adapted to its frozen homeland by having a compact body, short legs and small ears that reduce the amount of lost heat by having a small surface area. Even the bottom of the Polar Fox’s feet are covered with fur which provides insulation and traction when walking on cold surfaces. To top off its warm suit of fur the Arctic Fox has a long bushy tail that can easily wrap around the entire body and keep the cold off the Fox’s nose. He is in fact, so acclimatized to the arctic conditions that temperatures of negative 94 degrees Fahrenheit doesn’t even cause him a shiver! He is in fact, so acclimatized to the arctic conditions that temperatures of negative 94 degrees Fahrenheit doesn’t even cause him a shiver! 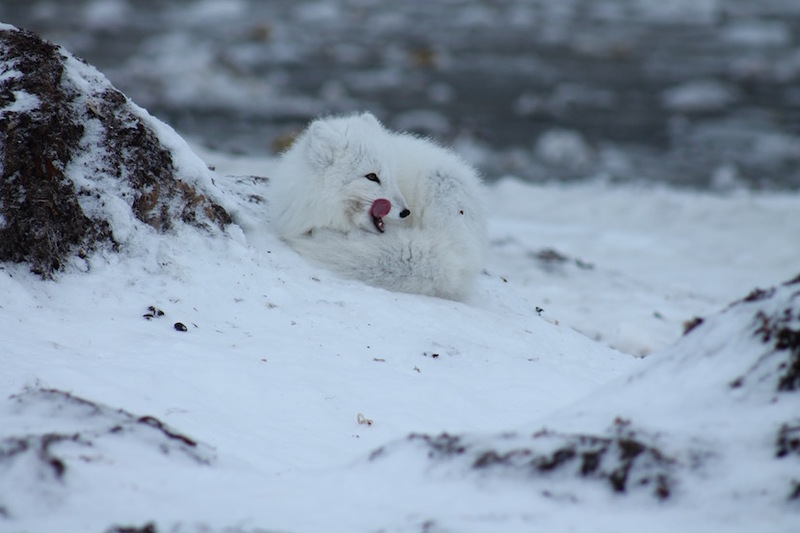 When the Arctic Fox does seek shelter, it is in well built burrows that can extend hundreds of yards and are often passed down from generation to generation. The Arctic Fox’s den has several entrances for security and even has refrigeration in the form of larders dug into the permafrost that is used to keep stores of food fresh during the summer months. Speaking of food, he will eat anything to provide the calories necessary for life on the tundra. Everything from rodents, berries, eggs, seaweed, birds, fish, small seals and the Fox’s favorite lemmings are on the menu. During the winter months the Fox uses its keen sense of hearing to listen for burrowing rodents under the snow. When located, the Fox will jump in the air and use his momentum to break through the frozen crust and pounce on his prey. Another sly trick to an easy meal is to follow Polar Bears and eat the leftovers after all the hard work has been done. The short arctic summer allows the Foxes to have their litters which are raised by the parents together often in family groups. 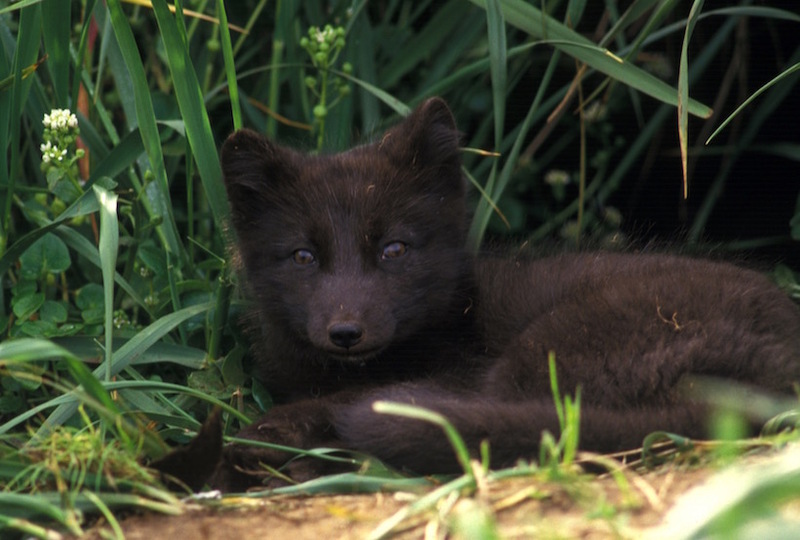 Ever adaptable, the Polar Fox’s coat turns brown or grey to blend into the summer landscape. The Foxes also use this break from the snow and cold to work on plumping up and adding a nice layer of fat to prepare for the next winter ahead. These little guys are truly the toughest of the tough who thrive in some of the harshest conditions on the planet. So while most bears are hibernating and you reach for an extra warm sweater this winter, just think of the Arctic Fox who hasn’t even begun to feel the chill even though he can probably see the North Pole from his door step!